With the increasing demand from the industry, to process big data at a faster pace -Apache Spark is gaining huge momentum when it comes to enterprise adoption. 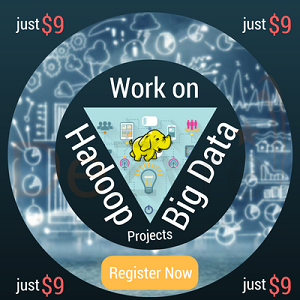 Hadoop MapReduce well supported the need to process big data fast but there was always a need among developers to learn more flexible tools to keep up with the superior market of midsize big data sets, for real time data processing within seconds. To support the momentum for faster big data processing, there is increasing demand for Apache Spark developers who can validate their expertise in implementing best practices for Spark - to build complex big data solutions. In collaboration with and big data industry experts -we have curated a list of top 50 Apache Spark Interview Questions and Answers that will help students/professionals nail a big data developer interview and bridge the talent supply for Spark Developers across various industry segments. Companies like Amazon, Shopify, Alibaba and eBay are adopting Apache Spark for their big data deployments- the demand for Spark developers is expected to grow exponentially. Google Trends confirm “hockey-stick-like-growth” in Spark enterprise adoption and awareness among organizations across various industries. Spark is becoming popular because of its ability to handle event streaming and processing big data faster than Hadoop MapReduce. 2017 is the best time to hone your Apache Spark skills and pursue a fruitful career as a data analytics professional, data scientist or big data developer. DeZyre’s Apache Spark Certification will help you develop skills which will make you eligible to apply for Spark developer job roles. Preparation is very important to reduce the nervous energy at any big data job interview. Regardless of the big data expertise and skills one possesses, every candidate dreads the face to face big data job interview. 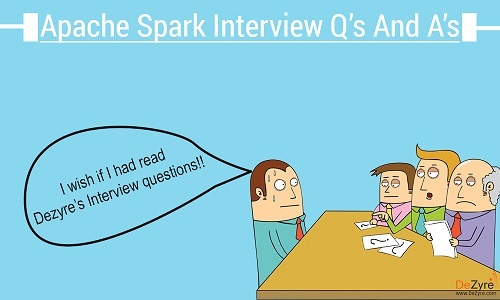 Though there is no way of predicting exactly what questions will be asked in any big data or spark developer job interview- these Apache spark interview questions and answers might help you prepare for these interviews better. Does not leverage the memory of the hadoop cluster to maximum. Let's save data on memory with the use of RDD's. MapReduce is disk oriented. Spark caches data in-memory and ensures low latency. Only batch processing is supported Supports real-time processing through spark streaming. Is bound to hadoop. Is not bound to Hadoop. Simplicity, Flexibility and Performance are the major advantages of using Spark over Hadoop. Spark is 100 times faster than Hadoop for big data processing as it stores the data in-memory, by placing it in Resilient Distributed Databases (RDD). Spark is easier to program as it comes with an interactive mode. It provides complete recovery using lineage graph whenever something goes wrong. Most of the data users know only SQL and are not good at programming. Shark is a tool, developed for people who are from a database background - to access Scala MLib capabilities through Hive like SQL interface. Shark tool helps data users run Hive on Spark - offering compatibility with Hive metastore, queries and data. 3) List some use cases where Spark outperforms Hadoop in processing. Sensor Data Processing –Apache Spark’s ‘In-memory computing’ works best here, as data is retrieved and combined from different sources. Stream Processing – For processing logs and detecting frauds in live streams for alerts, Apache Spark is the best solution. 4) What is a Sparse Vector? A sparse vector has two parallel arrays –one for indices and the other for values. These vectors are used for storing non-zero entries to save space. 6) Explain about transformations and actions in the context of RDDs. Transformations are functions executed on demand, to produce a new RDD. All transformations are followed by actions. Some examples of transformations include map, filter and reduceByKey. Actions are the results of RDD computations or transformations. After an action is performed, the data from RDD moves back to the local machine. Some examples of actions include reduce, collect, first, and take. 7) What are the languages supported by Apache Spark for developing big data applications? 8) Can you use Spark to access and analyse data stored in Cassandra databases? Yes, it is possible if you use Spark Cassandra Connector. 9) Is it possible to run Apache Spark on Apache Mesos? Yes, Apache Spark can be run on the hardware clusters managed by Mesos. Apache Mesos -Has rich resource scheduling capabilities and is well suited to run Spark along with other applications. It is advantageous when several users run interactive shells because it scales down the CPU allocation between commands. Standalone deployments – Well suited for new deployments which only run and are easy to set up. 11) How can Spark be connected to Apache Mesos? Install Apache Spark in the same location as that of Apache Mesos and configure the property ‘spark.mesos.executor.home’ to point to the location where it is installed. 12) How can you minimize data transfers when working with Spark? Using Broadcast Variable- Broadcast variable enhances the efficiency of joins between small and large RDDs. Using Accumulators – Accumulators help update the values of variables in parallel while executing. The most common way is to avoid operations ByKey, repartition or any other operations which trigger shuffles. 13) Why is there a need for broadcast variables when working with Apache Spark? These are read only variables, present in-memory cache on every machine. When working with Spark, usage of broadcast variables eliminates the necessity to ship copies of a variable for every task, so data can be processed faster. Broadcast variables help in storing a lookup table inside the memory which enhances the retrieval efficiency when compared to an RDD lookup (). 14) Is it possible to run Spark and Mesos along with Hadoop? Yes, it is possible to run Spark and Mesos with Hadoop by launching each of these as a separate service on the machines. Mesos acts as a unified scheduler that assigns tasks to either Spark or Hadoop. 15) What is lineage graph? The RDDs in Spark, depend on one or more other RDDs. The representation of dependencies in between RDDs is known as the lineage graph. Lineage graph information is used to compute each RDD on demand, so that whenever a part of persistent RDD is lost, the data that is lost can be recovered using the lineage graph information. 16) How can you trigger automatic clean-ups in Spark to handle accumulated metadata? You can trigger the clean-ups by setting the parameter ‘spark.cleaner.ttl’ or by dividing the long running jobs into different batches and writing the intermediary results to the disk. Spark MLib- Machine learning library in Spark for commonly used learning algorithms like clustering, regression, classification, etc. Spark Streaming – This library is used to process real time streaming data. Spark GraphX – Spark API for graph parallel computations with basic operators like joinVertices, subgraph, aggregateMessages, etc. Spark SQL – Helps execute SQL like queries on Spark data using standard visualization or BI tools. 18) What are the benefits of using Spark with Apache Mesos? It renders scalable partitioning among various Spark instances and dynamic partitioning between Spark and other big data frameworks. 19) What is the significance of Sliding Window operation? Sliding Window controls transmission of data packets between various computer networks. Spark Streaming library provides windowed computations where the transformations on RDDs are applied over a sliding window of data. Whenever the window slides, the RDDs that fall within the particular window are combined and operated upon to produce new RDDs of the windowed DStream. 20) What is a DStream? Transformations that produce a new DStream. Output operations that write data to an external system. 21) When running Spark applications, is it necessary to install Spark on all the nodes of YARN cluster? Spark need not be installed when running a job under YARN or Mesos because Spark can execute on top of YARN or Mesos clusters without affecting any change to the cluster. 22) What is Catalyst framework? Catalyst framework is a new optimization framework present in Spark SQL. It allows Spark to automatically transform SQL queries by adding new optimizations to build a faster processing system. 23) Name a few companies that use Apache Spark in production. 24) Which spark library allows reliable file sharing at memory speed across different cluster frameworks? Work On Interesting Data Science Projects using Spark to build an impressive project portfolio! 25) Why is BlinkDB used? BlinkDB is a query engine for executing interactive SQL queries on huge volumes of data and renders query results marked with meaningful error bars. BlinkDB helps users balance ‘query accuracy’ with response time. 26) How can you compare Hadoop and Spark in terms of ease of use? Hadoop MapReduce requires programming in Java which is difficult, though Pig and Hive make it considerably easier. Learning Pig and Hive syntax takes time. Spark has interactive APIs for different languages like Java, Python or Scala and also includes Shark i.e. Spark SQL for SQL lovers - making it comparatively easier to use than Hadoop. 27) What are the common mistakes developers make when running Spark applications? Hitting the web service several times by using multiple clusters. Run everything on the local node instead of distributing it. Developers need to be careful with this, as Spark makes use of memory for processing. 28) What is the advantage of a Parquet file? 29) What are the various data sources available in SparkSQL? 30) How Spark uses Hadoop? 31) What are the key features of Apache Spark that you like? It has good performance gains, as it helps run an application in the Hadoop cluster ten times faster on disk and 100 times faster in memory. 32) What do you understand by Pair RDD? Special operations can be performed on RDDs in Spark using key/value pairs and such RDDs are referred to as Pair RDDs. Pair RDDs allow users to access each key in parallel. They have a reduceByKey () method that collects data based on each key and a join () method that combines different RDDs together, based on the elements having the same key. 33) Which one will you choose for a project –Hadoop MapReduce or Apache Spark? The answer to this question depends on the given project scenario - as it is known that Spark makes use of memory instead of network and disk I/O. However, Spark uses large amount of RAM and requires dedicated machine to produce effective results. So the decision to use Hadoop or Spark varies dynamically with the requirements of the project and budget of the organization. 34) Explain about the different types of transformations on DStreams? Stateless Transformations- Processing of the batch does not depend on the output of the previous batch. Examples – map (), reduceByKey (), filter (). Stateful Transformations- Processing of the batch depends on the intermediary results of the previous batch. Examples –Transformations that depend on sliding windows. 36) Is Apache Spark a good fit for Reinforcement learning? 37) What is Spark Core? 38) How can you remove the elements with a key present in any other RDD? 40) What are the various levels of persistence in Apache Spark? 41) How Spark handles monitoring and logging in Standalone mode? 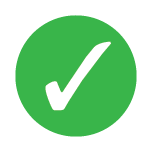 42) Does Apache Spark provide check pointing? 43) How can you launch Spark jobs inside Hadoop MapReduce? 44) How Spark uses Akka? 45) How can you achieve high availability in Apache Spark? Using StandBy Masters with Apache ZooKeeper. 46) Hadoop uses replication to achieve fault tolerance. How is this achieved in Apache Spark? 47) Explain about the core components of a distributed Spark application. 48) What do you understand by Lazy Evaluation? 49) Define a worker node. 50) What do you understand by SchemaRDD? 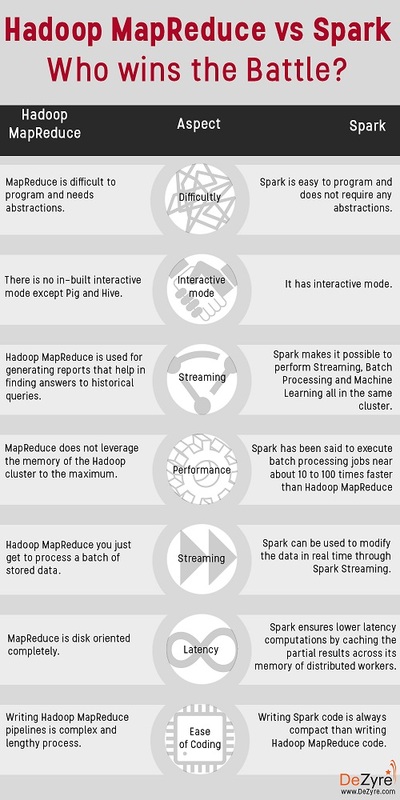 51) What are the disadvantages of using Apache Spark over Hadoop MapReduce? Apache spark does not scale well for compute intensive jobs and consumes large number of system resources. Apache Spark’s in-memory capability at times comes a major roadblock for cost efficient processing of big data. Also, Spark does have its own file management system and hence needs to be integrated with other cloud based data platforms or apache hadoop. 52) Is it necessary to install spark on all the nodes of a YARN cluster while running Apache Spark on YARN ? No , it is not necessary because Apache Spark runs on top of YARN. 53) What do you understand by Executor Memory in a Spark application? Every spark application has same fixed heap size and fixed number of cores for a spark executor. The heap size is what referred to as the Spark executor memory which is controlled with the spark.executor.memory property of the –executor-memory flag. Every spark application will have one executor on each worker node. The executor memory is basically a measure on how much memory of the worker node will the application utilize. 54) What does the Spark Engine do? Spark engine schedules, distributes and monitors the data application across the spark cluster. 55) What makes Apache Spark good at low-latency workloads like graph processing and machine learning? Apache Spark stores data in-memory for faster model building and training. Machine learning algorithms require multiple iterations to generate a resulting optimal model and similarly graph algorithms traverse all the nodes and edges.These low latency workloads that need multiple iterations can lead to increased performance. Less disk access and controlled network traffic make a huge difference when there is lots of data to be processed. 56) Is it necessary to start Hadoop to run any Apache Spark Application ? Starting hadoop is not manadatory to run any spark application. As there is no seperate storage in Apache Spark, it uses Hadoop HDFS but it is not mandatory. The data can be stored in local file system, can be loaded from local file system and processed. 57) What is the default level of parallelism in apache spark? If the user does not explicitly specify then the number of partitions are considered as default level of parallelism in Apache Spark. The foremost step in a Spark program involves creating input RDD's from external data. Use various RDD transformations like filter() to create new transformed RDD's based on the business logic. persist() any intermediate RDD's which might have to be reused in future. Launch various RDD actions() like first(), count() to begin parallel computation , which will then be optimized and executed by Spark. 59) In a given spark program, how will you identify whether a given operation is Transformation or Action ? i) The operation is an action, if the return type is other than RDD. ii) The operation is transformation, if the return type is same as the RDD. 60) What according to you is a common mistake apache spark developers make when using spark ? Maintaining the required size of shuffle blocks. What is wrong with the above code and how will you correct it ? 1) Explain the difference between Spark SQL and Hive. Spark SQL is faster than Hive. Any Hive query can easily be executed in Spark SQL but vice-versa is not true. Spark SQL is a library whereas Hive is a framework. It is not mandatory to create a metastore in Spark SQL but it is mandatory to create a Hive metastore. Spark SQL automatically infers the schema whereas in Hive schema needs to be explicitly declared..
1) Name some sources from where Spark streaming component can process real-time data. 2) Name some companies that are already using Spark Streaming. 3) What is the bottom layer of abstraction in the Spark Streaming API ? 4) What do you understand by receivers in Spark Streaming ? Receivers are special entities in Spark Streaming that consume data from various data sources and move them to Apache Spark. Receivers are usually created by streaming contexts as long running tasks on various executors and scheduled to operate in a round robin manner with each receiver taking a single core. 5) How will you calculate the number of executors required to do real-time processing using Apache Spark? What factors need to be connsidered for deciding on the number of nodes for real-time processing? The number of nodes can be decided by benchmarking the hardware and considering multiple factors such as optimal throughput (network speed), memory usage, the execution frameworks being used (YARN, Standalone or Mesos) and considering the other jobs that are running within those execution frameworks along with spark. 6) What is the difference between Spark Transform in DStream and map ? tranform function in spark streaming allows developers to use Apache Spark transformations on the underlying RDD's for the stream. map function in hadoop is used for an element to element transform and can be implemented using transform.Ideally , map works on the elements of Dstream and transform allows developers to work with RDD's of the DStream. map is an elementary transformation whereas transform is an RDD transformation. Check Out Top Scala Interview Questions for Spark Developers. Learn Apache Spark online now and become a Certified Spark Developer!